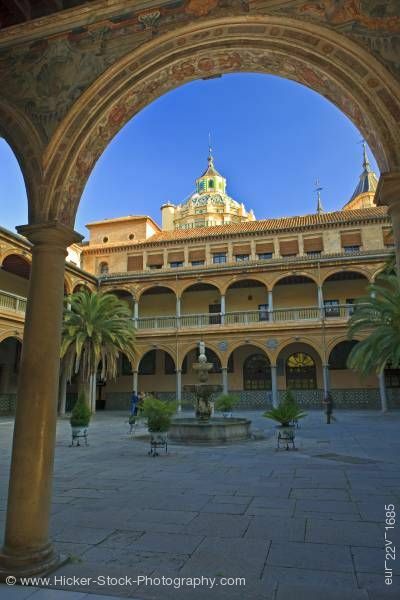 The courtyard of the Hospital San Juan de Dios in the City of Granada. This stock photo shows the Dome of the Basilica San Juan de Dios (church) seen from the courtyard of the Hospital Universitario Virgen de las Nieves - Hospital San Juan de Dios (San Juan de Dios Hospital), City of Granada, Province of Granada, Andalusia, Spain, Europe. Framed in an ornate archway is the courtyard of the hospital. The stone courtyard has a fountain in the center surrounded by potted plants. The two stories of archways surround the courtyard. The third floor has a tiled roof. The beautifully detailed dome of the San Juan de Dios is in the background of the San Juan de Dios Hospital. Dome of the Basilica San Juan de Dios (church) seen from the courtyard of the Hospital Universitario Virgen de las Nieves - Hospital San Juan de Dios (San Juan de Dios Hospital), City of Granada, Province of Granada, Andalusia (Andalucia), Spain, Europe.